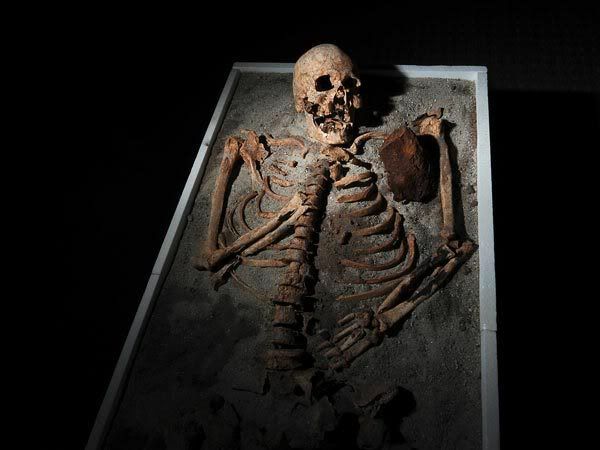 It seems that hundreds of skeletons like this have been found throughout Eastern Europe...with the skeletons died up, teeth pulled, iron or wooden stakes through their chests, or otherwise mangled. For some reason the belief in Vampires coming back from the dead was very strong in that region, especially in the area around Bulgaria and Romania. It's kind of like the way the belief in witches really spread throughout the New England area and caused things like the Salem Witch Trials to occur. I wonder what it was that caused such a widespread belief in vampires in Eastern Europe? Something must have started it. The belief and persecution of witches had already swept through Europe resulting in (estimation) millions of people killed. In some areas, after the witchhunter/religious examiner was done, the whole village was burned, hanged, whatever. The belief that witches used cats as familiars resulted in wholesale killing of cats which may have had a part in the spread of the Bulbonic Plague. The people who came to New England wanted stricter church rules - they came to set up their own kingdom. No surprise that the fear of witches came with them. What might be a surprise is that the new settlers (in spite of having been fed and cared for by the First Nations inhabitants of the land they took) convinced themselves that the Devil lived in Indians (because they were not baptized and good with the New Englander's God). They were by then killing off the Indians (so that they could expand their land holdings) and believed that when they did - the Devil got loose and possibly went into a white settler's body - like that of a prepubescent girl. PS. There have always been wise women, herbalists, and dare I say, witches. They have nothing to do with the Devil, a distinctly Christian intervention, occuring rarely and only in the New Testiment after the expulsion from the garden due to knowing too much (thanks to the serpent, Devil? etc). Witches, according to my studies, don't worship anyone or any being. The Goddess or Hunter God may be invoked or honored to achieve community harmony or get a task done. Abasing onself to the Devil, sacrificing babies yada yada were details taken from the witch hunters' (Catholic, Jesuit, and Protestant) guide: The Hammer of God. Written by, IMO, sick human beings intent on establishing power or scapegoating others in hard times.